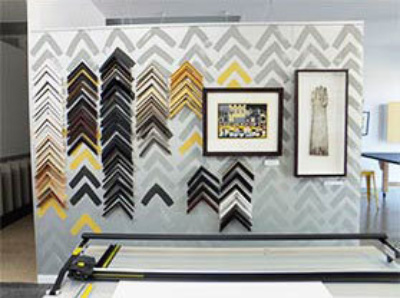 S&J Framing Workshop includes a gallery space and window display for framed artworks. Our Gallery walls include an eclectic mix of framed works. We specialise in collecting a diverse and interesting range of vintage pieces, be it 2D and 3D. Much of it is unsigned and unknown, but beautiful & interesting. Often too at a reasonable price. Great for that impromptu purchase. We also have select framed works by local artists exclusive to S&J. We enjoy our relationships we have with our creative counterparts. S&J also frame up and sell a selection of 'known artist's' works. We have lithographs by John Brack, Sidney Nolan & Charles Blackman to name a few. Often again unsigned, which adds to the appealing and doable price point. We have an ongoing relationship with many Interior designers & Architects who appreciate our contemporary edge and value our advice and individuality. S&J Framing Workshop is right in the middle of a vibrant, high-profile shopping strip in High St, Prahran and we aim to offer an interesting and ever-changing environment to both entice and visually reward local audiences. Group or thematic shows will also run throughout the year. We have an Annual Christmas Show held in the 3rd week of November. There’s going to be a lot going on so be sure to stop by regularly to see what’s on display!